What are the most popular online bachelor's degrees offered in Missouri? The Missouri Department of Higher Education estimated that only 37.6% of adults in the state held either an associate or bachelor's degree. This, combined with the fact that high-paying jobs increasingly require a college education, has led Missouri to create an initiative known as the “Big Goal for Higher Education.” The objective is to increase the number of degree holders to 60% of the adult population by 2025. Online colleges in Missouri have become popular in recent years, due to their flexibility and generally lower tuition. As part of the Midwestern Higher Education Compact (MHEC), residents can enroll in courses and programs at over 100 of participating colleges and universities at a reduced cost. Missouri is also a member of the State Authorization Reciprocity Agreement (SARA), an organization that regulates the quality of online courses and programs at its participating institutions, while also facilitating opportunities for students to take select online courses at out-of-state schools. These institutions also agree to tuition reciprocity, resulting in lower tuition across the board. Residents are taking advantage of these programs. In 2012, the National Center for Education Statistics (NCES) reported that 71.3% of those participating in Missouri's online programs lived in the state. This number has increased over the past four years, and experts expect it continue rising going forward. Located in Springfield, Missouri State was founded in 1905 and prides itself on providing an education that prepares its students to be engaged and compassionate professionals, scholars, and global citizens. MSU offers several online degree and certificate programs, and is among the best online colleges in Missouri for graduate-level work in the field of education. With degrees in areas like elementary education and literacy, students are able to find and personalize the degree that best fits their interests and goals.The school also offers certificate programs in areas like educational technology and the development of deaf and hard of hearing students that impart specialized knowledge and skills to help working professionals further develop their careers. MSU’s tuition rate is, across the board, well below the national average, making it one of the most affordable among Missouri online colleges. Online students get the same benefits as their campus counterparts, including access to all available financial aid, tutoring services, and career assistance and job placement opportunities. Located in Fayette, Missouri, Central Methodist was established in 1854 and today enrolls more than 5,2000 students annually. CMU offers distance learning pathways through the College of Graduate and Extended Studies, and like other Missouri online colleges, offers several undergraduate and graduate degree programs in areas like business, public administration, and accounting. The school stands out as one of the best online colleges in Missouri for the nursing field. CMU not only offers an RN-BSN track, but also a master of science in nursing (MSN) degree, with two specialization tracks in leadership and education. Distance learners have access to a number of academic support services, including The Center for Learning and Teaching, which provides subject tutoring and studying assistance.Tuition is priced per credit hour and dependent on the program. Due to CMU’s accreditation policy, some online programs are not available in certain states. Check the offerings list for more details. Founded in 1915, Webster prides itself on providing personalized study and career development to a population of diverse students from more than 100 countries. As part of the community of Missouri online colleges, Webster offers a number of distance undergraduate and graduate degree programs. Facilitated by WorldClassRoom, online courses are created with distance learners in mind and are taught by the same highly skilled and passionate instructors who teach at the campus in St. Louis, Missouri. Webster is one of the best online colleges in Missouri for professional development due to its large catalog of certificate programs, including postgraduate training for educators in areas like mobile technology, English as a foreign language (ESL), and teaching for global sustainability. Tuition is priced per credit hour and a variety of financial aid options are available, including reduced costs for military personnel and awards based on merit and need, like the Webster Academic Scholarship for transfer students and the Leadership Scholarship for students with a passion for community engagement and stewardship. Mizzou was established in 1839 as the first public university west of the Mississippi. The school’s distance learning program is one of the the largest among Missouri online colleges, offering over 89 degree and certificate pathways. Those interested in a master’s degree can pursue programs in early childhood education, interactive media, and biomedical sciences, among many other options, while professionals interested in advancing their career can look into development programs in areas such as energy efficient engineering and agroforestry. Distance learners pay in-state tuition, unless their specific program dictates otherwise. As a large public institution, Mizzou is one of the best online colleges in Missouri in terms of financial aid, offering a variety of private scholarships, including institutional grants, program-specific funds, and a 10% online tuition reduction for military personnel and their spouses. Distance learners get the same access to student services as their campus peers, including career counseling, writing assistance, and subject tutoring through the NetTutor platform. Located in Rolla, MST was founded in 1980 and takes pride in its long heritage of technological innovation and creative teaching methods. MST offers a host of graduate degree and professional development programs for distance learners and is one of the best online colleges in Missouri. Based in the College of Distance and Continuing Education, students can enroll in over 50 certificate programs and 17 master’s programs in the fields of business, engineering, and science. Almost all the master’s programs consist of a 30-credit curriculum and because most of MST’s online students are working adults, they pursue the degree part time and finish in three to four years. Unlike many other Missouri ing online colleges, MST also offers a pathway into a doctorate degree for distance learners on a case-by-case basis. Financial aid is available, including tuition discounts and remission for active military and veterans, and the option to transfer credits garnered through military training towards their degree or certificate program. City Vision, located in Kansas City, was established in 1998 as an accredited Christian university dedicated to providing affordable and quality education to underserved communities through online learning initiatives. City Vision offers five undergraduate degree programs and one graduate, a master’s degree in technology and social entrepreneurship (MTSE). Consisting of a 36-credit curriculum, the MTSE is an interdisciplinary program that focuses on synthesizing business ideas strategies with cutting-edge technology towards a lucrative bottom line and ethical considerations that parallel Christian teachings. CVU’s tuition rates are fixed and low, making it one of the best online colleges in Missouri in terms of cost. Financial aid is available, including a 25% tuition discount for active and reserve military and veterans. CVU also stands out among other Missouri online colleges for its dedicated internship placement program that places students with business and organizations in their area. As a public research institution and one of the four schools in the University of Missouri system, UMSL provides several top quality online undergraduate and graduate programs. Students have over 50 rigorous programs from which to choose -- 14 undergraduate and 39 graduate -- all while pursuing their academic and professional goals from the comfort of their home or office. Bachelor’s degrees are available in fields such as business administration, criminology and criminal justice, nursing, and political science. Graduate degrees include community education, elementary education, and nursing. Undergraduate applicants must hold a high school diploma or it equivalent and must submit official transcripts. ACT or SAT scores are also required. Graduate applicants must have earned a bachelor’s degree with a cumulative GPA of at least 2.75 and need to submit official transcripts. Prospective graduate students should also check examination requirements with their intended academic department. Missouri and Illinois residents receive discounts on tuition. Located in Kirksville, Missouri, Truman State was founded in 1867 as a training college for teachers. Over the years, Truman has grown into a highly regarded and selective public institution for the study of liberal arts and sciences. Unlike other Missouri online colleges, Truman catalogs its remote courses not by degree, but individually, allowing for students to search for the ones that best suit their academic and professional needs. A range of online courses are offered during the regular semesters and even more are offered during interim and summer sessions to further accommodate nontraditional students. Online classes are facilitated through Blackboard and presented asynchronously, allowing students to access lessons and materials on their own time, though there are deadlines. Undergraduate tuition is priced at a flat rate for full-time study, while graduate tuition is paid per credit hour. Both are affected by residency status, but at $7,152 per semester for in-state residents, Truman is one of the best online colleges in Missouri in terms of affordability. Founded in 1953, Washington U in St. Louis expounds the motto of Per Veritatem Vis, or “Strength Through Truth,” and is regularly ranked as one of the best online colleges in Missouri for its undergraduate programs and overall retention and graduation rates. Distance learning is facilitated through the University College of Professional & Continuing Education. Several certificate programs are offered completely online, but students seeking undergraduate or graduate degrees should be prepared to take some of their coursework on campus. Washington U stands out among Missouri online colleges for its specialized master of science in biology for science teachers (MSBST). A hybrid program, the MSBST is a two-year program designed for working teachers; it consists of online classes and two in-residence summer institutes that provide teaching practicums and professional networking seminars. Tuition is priced per credit hour and select scholarships are available. Active military and veterans enjoy a number of additional benefits, including tuition discounts and vocational rehabilitation opportunities. Established in 1873 and located in Cape Girardeau, SEMO has a rich history of providing excellent and affordable education to students of all backgrounds. As a leader among Missouri online colleges, SEMO offers remote certificate and degree programs, including several master’s degrees in the field of education with specialized pathways in secondary learning, exceptional child education, and teaching English to speakers of other languages. SEMO also offers a number of certificate and expert-level programs the areas of educational leadership and administration. Designed for experienced teachers, these nationally and state-accredited programs prepare graduates for high-ranking positions in their field. SEMO is also one of the best online colleges in Missouri for active military and veterans, offering not only in-state tuition prices for them and their dependents, but also a dedicated financial aid package entitled “Southeast Salutes”, which includes scholarships and extended deferment options for tuition and other academic fees. Located in Moberly, Missouri, CCCB was established in 1957 and is dedicated to providing an education that prepares students to be professional, civic, and spiritual leaders in their communities. CCCB began to offer distance learning options in 2011 and today has three online degree programs: the associate of biblical studies, the bachelor of religious studies in Christian leadership, and the BS in Bible. These very specialized degree programs make CCCB one of the best online colleges in Missouri for pastoral studies; as do their certificates in various fields of biblical literature. Online courses are presented in an eight-week structure and CCCB’s online bachelor’s degree programs, designed with nontraditional students in mind, have a flexible transfer credit policy. Online tuition is priced at $275 per credit hour for all students, making the school one of the most affordable among Missouri online colleges. Furthermore, CCCB gives out over 100 full-tuition scholarships per year to students of all backgrounds and academic standings. UCMO, located in Warrensburg, stands dedicated to community service and engaged learning practices. Founded in 1871, UCMO now serves more than 14,000 students of diverse backgrounds annually and offers a number of programs for distance learners, including undergraduate and graduate degrees in the areas of criminal justice, occupational education, aviation safety, and more. UCMO stands out among Missouri online colleges for its institutional partnerships with PBS and Indiana State University. Students have the opportunity to take professional development courses with PBS that work into their degree progress, and can pursue a cooperative doctoral degree with ISU in the field of technology management. Online students enjoy resources including financial aid opportunities and access to KC REACHE, an academic and professional support portal for students in the regional consortium. Boasting some of the lowest tuition rates nationally, with all students paying less than $400 per credit hour, UCMO is one of the best online colleges in Missouri for those looking for an affordable education. Located in Lake Charles, Missouri, Lindenwood was founded in 1827 and is dedicated to providing an ethical and integrative liberal arts education. True to its mission of inclusive teaching, Lindenwood offers 10 accredited degree programs and more than 100 courses remotely each academic session. From a bachelor’s degree in criminal justice to an MS in nursing, anyone can find the program that best fits their career goals. Lindenwood is also one of very few Missouri online colleges to offer a master of fine arts (MFA) in writing online. Consisting of 48 credit hours, the MFA curriculum focuses on building a writer’s skills through literature courses and intensive craft classes and workshops, culminating with a thesis project of original creative work. Tuition is priced per full-time enrollment and may be dependent on the degree program you pursue. Lindenwood is one of the best online colleges in Missouri when it comes to student services. All online students have access to the school’s rich network of support, ranging from career development and counseling, to academic and professional opportunities in the Honors College and other organizations. William Woods was originally founded in 1870 as a school for girls who had been orphaned by the devastation of the American Civil War, and over the years has grown into a private institution of education and leadership for all students. Located in Fulton, Missouri, WWU also provides an affordable online learning experience structured in eight-week courses for maximum flexibility. The school offers four online undergraduate programs, including an online BS in paralegal studies. WWU is one of the best online colleges in Missouri for transfer students, offering bachelor’s transfer programs for distance students; this includes an online BS in interpretation studies and a BS in business administration. Those interested in pursuing a master's degree in education should consider WWU as it offers several in the field, including athletics and equestrian education, two programs not found at many other Missouri online colleges. Financial aid is available, including additional assistance for active and reserve military as well as veterans. Located in Saint Louis, Missouri, Fontbonne was founded as an institution of higher education for women and held its first classes in 1923. Today, the school offers 42 undergraduate majors and 17 graduate programs, many of which can be completed entirely online. Distance learners have access to certificate and degree programs in areas like speech-language pathology, education, business administration, and supply chain management. Fontbonne is one of the best online colleges in Missouri for education professionals looking to obtain a degree and advance their careers. The paraprofessional pathways programs enable those already working in the field of special education to earn their bachelor’s or master’s degree through a combination of flexible online courses. Clinical experience can be completed on the job, allowing students to work full-time while earning their degree. Tuition is priced per credit hour and online students enjoy access to a number of student services, including tutoring and other assistance through the Kinkel Center for Academic Resources. University of Missouri-Kansas City offers several nationally recognized undergraduate and graduate degree programs, particularly in nursing, where students can complete their degree at the bachelor’s, master’s, or doctoral levels. Other standout programs include education and a bachelor of liberal arts degree completion program, specifically designed for students who have accumulated 65 college credits and wish to complete their bachelor’s degree studies. Admissions requirements vary by level and program. Undergraduates must possess a high school diploma and need to submit official transcripts that highlight the necessary prerequisite courses. They must also submit ACT or SAT scores. Prospective undergraduate nursing students must have RN certification. Graduate applicants need to hold a bachelor’s degree and must submit official transcripts. Specific GPA and pre-graduate examination requirements vary by program. Graduate applications also include consultations with academic advisors. Missouri residents pay discounted tuition. Located in Maryville, NW Missouri State was founded in 1905 as a state-assisted university and today offers over 160 undergraduate and graduate degree programs. Many of these programs are available to distance learners through the Northwest Online platform. The catalog of online degree programs includes two bachelor’s degrees in business management and marketing and several graduate degrees in fields such as special education and instructional technology. The school offers an online BS in business management, a BS in marketing, and an online MBA. Northwest is one of the best online colleges in Missouri for students interested in geosciences and statistics, as the school offers an MS in geographic information science, preparing students for work in private industries and the public sector. Most online courses last 15 weeks, though there are options to take accelerated classes during the summer term. Tuition is priced per credit hour and dependent on the student’s residency status. Various forms of financial aid are available. For example, through its Bearcat Advantage Scholarship, Northwest is one of the few Missouri online colleges to offer out-of-state students the opportunity to pay the prices of a state resident. Saint Louis University, located in the titular city, is one of the oldest and most respected Catholic universities in the United States, recognized for its academic achievements as well as its dedication to service, stewardship, and healthcare. Founded in 1818, SLU now enrolls 13,000 students annually and through its School for Professional Studies, offers many courses and degree programs remotely. Among SLU’s extensive catalog of online degree programs include undergraduate options in aviation management and computer information systems, as well as graduate degrees in the areas of law enforcement administration, global corporate security, and others. SLU stands out among other Missouri online colleges for its bridge programs, which allow students to gain both their bachelor’s and master’s degrees at an accelerated pace. The BA/MA in leadership and organizational development and the BS/MS in applied analytics pathways enable anyone interested in these fields to obtain their accreditation in less than five years with full-time enrollment. Tuition rate is affordable and fixed per credit hour, and SLU is one of the best online colleges in Missouri in terms of flexibility, allowing students to take courses during any of its five, eight-week sessions. Drury University is located in Springfield, Missouri, and is dedicated to providing its students with an education that effectively connects the arts and sciences with real-world skills and professional knowledge. Through the College of Continuing Professional Studies, Drury offers many degree and certificate programs remotely. Like other Missouri online colleges, Drury’s distance learning offerings are focused on the fields of legal studies, business, and education, with the exceptions of a few degrees in the liberal arts. Those interested in graduate-level work in the field of education will find several options, including degrees in instructional mathematics and online teaching. Drury is also one of the best one colleges in Missouri for emergency management, offering both an associate and a bachelor’s degree designed to impart knowledge and skills in practical settings, preparing graduate to assist and protect their communities. Online courses are facilitated through Blackboard and tuition is affordably priced at $299 per credit hour. Missouri Baptist was originally established in 1957 as a school for pastors and laymen. Located in Saint Louis, today the institution is fully accredited and offers over 70 undergraduate, graduate, and doctoral programs, many of which can be completed remotely. Among MBU’s online degree pathways are programs in healthcare management, corporate security leadership, and criminal justice. MBU is also one of the handful of Missouri online colleges to offer both bachelor’s and master’s degrees in fitness and sport management, programs which prepare graduates to train private clients and manage interscholastic and intercollegiate athletics, respectively. Tuition at MBU is low, with undergraduate students paying $390 per credit hour and graduate costs priced at less than $600 per hour. Generous financial aid opportunities are available and, overall, students at MBU pay less than 50% of their overall costs of attendance, making it one of the best online colleges in Missouri in terms of affordability. Military veterans receive additional aid through the Yellow Ribbon Program and GI bills. Evangel University offers online students flexible degrees integrated with a Christian approach to life and learning. Located in the city of Springfield, the university offers several associate, bachelor’s, master’s degrees entirely online. Students may also earn a master of arts in theological studies and doctor of education leadership without ever visiting campus. The university also offers two seminary degrees in a hybrid format: the master of leadership in ministry and master of arts in intercultural studies. Incoming freshman must provide ACT or SAT -- even for an associate degree -- and submit high school transcripts with a cumulative GPA of 2.0 or higher. Graduate applicants must possess a bachelor’s degree with a cumulative GPA of 3.0 or higher. All students pay the same tuition rates regardless of which state they reside in. Founded in 1937, Missouri Southern State is located in the city of Joplin, at the foot of the Ozark mountains, and serves about 6,000 students annually. Through its Distance Learning program, MSSU offers several undergraduate minor, bachelor’s, and certificate programs in the fields of health science, business administration, and criminal justice, among others. MSSU is one of the best online colleges in Missouri for transfer students, allowing them to transfer a large amount of previous college work towards their degree through the school’s several degree completion programs. Those interested in pursuing a degree in the health sciences should consider enrolling in one of MSSU’s bachelor’s of science programs in areas like respirology and dental hygiene. Online courses are facilitated through Blackboard and tuition is priced per credit hour and dependent on residency status. Financial aid opportunities are manifold and MSSU is one of a few Missouri online colleges to offer in-state tuition rates to out-of-state students through its Lion Pride Tuition Discount program. Columbia College was established in the mid-nineteenth century as a school for Christian women, eventually transitioning into a four-year coeducational college in 1970. Today Columbia offers more than 27 fully-accredited online degree programs, including undergraduate and graduate degrees in the fields of nursing, psychology, education, computer sciences, and marketing, to name a few. Roughly 16,000 students take one or more online courses at Columbia every year and the classes are taught on an eight-week schedule, with six sessions offered every year. Columbia is one of the best online colleges in Missouri for its low tuition; undergraduate students pay $290 per credit hour, while graduates pay $395 per hour. Online students have access to financial aid opportunities and other services like career counseling and academic advising. Though it’s headquartered in the titular Missouri city, Columbia stands out among other Missouri online colleges for its network of supporting campuses throughout the nation, enabling online students to get the one-on-one academic and professional help they may need. Established in 1872, Maryville is one of the oldest institutions of higher education in the region and today offers over 90 degree programs and boasts a 94% job placement rate for its graduates. Distance learning at Maryville is conducted through the School of Adult and Online Education, which offers degree programs in the fields of healthcare, business, and education. Maryville is one of the few Missouri online colleges to offer a doctor of education (EdD) pathway. Completed in as few as 32 months, the EdD program is focused on leadership and effective decision-making, preparing graduates to take on roles as admissions directors, academic deans, and other high-ranking positions. Maryville is also ranked among the best online colleges in Missouri for nursing, offering degree and professional development programs for students at all stages in their career. Tuition is priced flatly for undergraduate students and per credit for graduates. All students have access to the school’s financial aid opportunities, including the Multicultural Scholarship, which cuts the cost of tuition in half. Park University was founded in 1875 and provides an inclusive and innovative education to students, preparing them to be leaders in their field and engaged citizens in their communities. Located in Parkville, Missouri, the school offers a number of distance learning pathways, including over 24 bachelor’s degree programs in areas like social psychology, military history, and criminal justice administration. Non-degree credentials, called gainful employment programs, are also offered at Park and working professionals can advance their career with study in areas like nonprofit leadership and management information systems. Tuition rates at Park are some of the lowest among Missouri online colleges. The university has a long history of serving military students and remains one of the best online colleges in Missouri for active personnel, reservists, and veterans, who enjoy reduced tuition across the board and the ability to transfer up to 75 credits from training and field experiences towards their degree programs, among other benefits. Our affordability methodology considers value-driven metrics and ranks schools that have low tuition rates, as well as proven graduation rates and employment outcomes that provide a high ROI for students. For students in Missouri, there are plenty of opportunities to find an affordable program locally. While distance education provides more flexibility than an exclusively residential curriculum, there are still plenty of advantages to attending a local online college, including access to lower tuition prices and local scholarships. If you're considering going back to school, and are thinking about studying online, the following list of cheap accredited online colleges in Missouri will help you start your search. Founded as a school for chiropractic education, Logan offers several degree programs in healthcare. The BS in human biology is a distance program designed for students interested in either a career or continued education in medicine, podiatry, osteopathy, chiropractic, or dentistry. Alternatively, the BS in life science prepares graduates for a doctor of chiropractic career, and only accepts students who are already accepted into the school’s Doctor of Chiropractic program. One of the most affordable online colleges in Missouri, Logan students can earn their bachelor’s degree and doctor of chiropractic degree in about six years, providing considerable tuition savings. Central Methodist University, a small college affiliated with the United Methodist Church, emphasizes academic excellence, ethical leadership, and social responsibility. Fifteen undergraduate degrees are delivered online at CMU; bachelor's degrees are awarded in accounting, business, nursing, education, sports management, and sociology, among others. Courses are offered in either eight- or 16-week blocks. As one of the most affordable online colleges in Missouri, CMU offers a full range of financial aid, including grants and loans. Services for online learners include a dedicated writing center, tech support, library services, and veterans services. Transfer credits with a minimum 2.0 GPA are accepted. At University College at Washington University in St. Louis, working adults can earn a degree from a world-class institution at their convenience. Online degree programs are offered in fields like anthropology, economics, communications, and international studies. Notable programs include the BS in global leadership and management, a degree designed for business professionals to develop practical skills and strategies in management at the global level. The school is noted for its competitive tuition and generous financial assistance, making it one of the most affordable online colleges in Missouri. The school also offers accelerated learning options, personalized advising, and career planning to ensure student success during their program and after graduation. Missouri S&T is a top research and innovation institution with 98 degree programs and several design teams. Seventeen online degrees can be earned at the graduate level in areas such as civil engineering, computer science, MBA, manufacturing engineering, and technical communications. Notable programs include the 30 credit MS in explosives engineering, where students learn the practical and theoretical approaches of explosives engineering, one of the only of its kind in the nation. Online programs are delivered via streaming video, a learning management system, and live collaboration software. Financial aid and scholarships can help pay for tuition at Missouri S&T, one of the most affordable Missouri universities. Park University’s robust distance learning program includes more than 24 bachelor's degree programs, making an education attainable for busy working professionals. Areas of study leading include business administration, criminal justice, education, nursing, and psychology. The business management program is notable for several areas of specialization in computer information systems, healthcare management, international business, logistics, and marketing. Courses are delivered asynchronously using the Canvas LMS. One of the most affordable online colleges in Missouri, Park has one tuition for undergrad students, regardless of residency. Active duty military personnel, veterans, reservists, and their dependents receive reduced tuition. The University of Missouri has a storied history as the state’s largest and most comprehensive institution of higher learning, and is world renowned for its scholarship and research. The school’s approximately 300 degree offerings include 89 eLearning options administered via Mizzou Online. Areas of study include business administration, hospitality management, educational studies, radiography, and early childhood education. The school accepts transfer credits, and has established a transfer equivalency website to show which credits are likely to transfer. Upon enrollment at Mizzou, students are eligible for one of the school’s scholarships to help pay for tuition. One of the most affordable online colleges in Missouri, Mizzou Online provides students with additional free resources such as tutoring and career center E-resources. Established in 1998 as a Christian college, City Vision transforms at-risk communities by expanding their access to higher education. The school offers baccalaureate distance learning programs in business administration, Christian ministry and leadership, addiction studies, and urban missions. City Vision’s online programs are delivered in eight-week sessions with five start times per year. One of the most affordable colleges in Missouri, City Vision has a generous transfer policy that allows students to transfer up to 90 credits into a baccalaureate program, further helping reduce overall tuition costs. Affordability is a hallmark of City Vision, which charges a flat fee for courses and provides a 50% discount for students in developing countries. A large comprehensive institution with approximately 16,000 students, University of Missouri-Kansas City offers about 125 areas of study in classrooms with a 14:1 student-to-faculty ratio. eLearning meets diverse student learning needs, and UMKC Online offers degree and certificate programs that span the disciplines. Bachelor's degrees can be earned online in the liberal arts, nursing, and dental hygiene. Online programming at the institution is delivered fully online asynchronously, and in a blended format using the Blackboard Collaborate LMS. Additional resources for online learners include tutoring, library services, and tech support. With 88% of freshmen receiving some sort of financial aid, UMKC is among the most affordable colleges in Missouri. The mission of Central Christian College of the Bible is to produce a cadre of servant-leaders who graduate without great financial burden. Central offers an online associate degree in biblical studies, which emphasizes study of the Bible and ministry, while two baccalaureate degrees are available online in religious studies and Bible. A 16-credit certificate program in Bible and ministry, and a 32-credit certificate of biblical knowledge, can each be completed full-time in one semester or part-time in two semesters. One of the most affordable online colleges in Missouri, the school offers 100 full-tuition scholarships to qualified new or transferring students. The school also offers loans and payment plans for those who do not qualify for the scholarships. Missouri State University’s mission is rooted in public affairs, and as a result, their educational programs emphasize ethical leadership and community engagement. Online bachelor’s and graduate degree programs span the disciplines. Undergraduate degree programs are offered in fields such as communication studies, finance, psychology, health services, and finance. Meanwhile, graduate students select from MBA programs, history, cyber security, nursing, and more. Programs are delivered via Blackboard, and student support services include a writing center, tutoring, and an online bookstore. One of the most affordable colleges in Missouri, the school’s tuition is lower than the state and national average. Missouri State also enrolls more transfer students than any other public college in the state. One of the oldest Catholic colleges in the nation, Saint Louis University is recognized for world-class academics, compassionate health care, and research. Online learners receive a rigorous Jesuit education in fields such as computer information systems, contract management, industrial psychology, and social work. The school’s BS in security and strategic intelligence is a unique program, offering concentrations in business continuity, strategic intelligence, and global corporate security. The BS in aviation management is also unique, providing a strong business core and helicopter pilot training via a partnership with Midwest Helicopter. Ninety percent of SLU students receive financial assistance, making this school one of the most affordable in the state. Distance learners at Webster receive a rich, affordable education. Baccalaureate eLearning programs are offered both full-time and part-time, and in fields such as criminology, educational studies, and management. Those who have accrued credits from other schools -- and would like to complete a baccalaureate degree -- can do so in data analytics, media communications, or nursing. Note that the school’s transfer applicants are required to meet the minimum cumulative 2.5 GPA on college-level coursework. Webster is one of the most affordable colleges in Missouri due to its competitive tuition and comprehensive financial aid assistance. Southeast Online provides highly ranked baccalaureate and master’s degrees that can be earned completely online. Programs are delivered asynchronously via courses eight and 16 weeks in length. Bachelor’s degree options include nursing, health administration, psychology, and computer information systems. Master’s degrees can be earned online in fields like business administration, which offers three areas of emphasis: sports management, teacher leadership, and several teacher prep programs. Southeast is one of the most affordable online colleges in Missouri, as online students pay one tuition rate regardless of in-state or out-of-state residency. The school also offers a full suite of financial aid options. In addition to scholarship, Northwest Missouri State University offers a learning experience that embraces lifelong study, intercultural competence, and collaboration. The school’s affordable bachelor’s degrees are offered online in business management and marketing. MBA degrees, which can be completed in as few as 12-18 months, are available online with specializations in resource management and marketing. Accelerated learning graduate degrees can be earned in education, with specializations such as educational leadership and special education available. Online programs at Northwest are delivered asynchronously in seven-week courses. Northwest, one of the most affordable online colleges in Missouri, offers competitive tuition and all online students pay the same tuition regardless of residency. Established in 1870, William Woods University is a learning community of approximately 3,500 students and faculty located in Fulton, MO. The school’s virtual college provides flexible undergraduate and graduate programs that promote collaboration, and are delivered in accelerated eight-week courses. Bachelor’s degrees can be earned in paralegal studies, business administration, interpretation studies in ASL-English, and workforce leadership. Graduate online programs are available in education, healthcare, STEM, and an MBA in entrepreneurship leadership. One of the top affordable colleges in Missouri, William Woods’ tuition promise guarantees locked in tuition rates during the duration of continuous enrollment. In addition to grants and student loans, the school offers numerous institutional scholarships. Founded as a Christian college for women, Columbia College now serves about 29,000 students via its Columbia campus, extended campuses in 13 states, and online. Approximately 5,100 learners study undergraduate and graduate programs at CC Online. Baccalaureate degrees can be earned in fields such as accounting, business administration, computer information systems, criminal justice administration, and healthcare administration. Graduate degrees can be earned online in instructional leadership, teaching, and principal initial certification. One of the most affordable online colleges in Missouri, CC features one tuition regardless of in-state or out-of-state residency; scholarships and grants are available to help pay for tuition, and military students receive reduced tuition. The University of Central Missouri emphasizes hands-on experience and service-learning to prepare graduates for lives of leadership. UCMOnline provides asynchronous learning opportunities leading to associate, bachelor’s, and graduate degrees. Degree programs include criminal justice, communication, nursing, technology management, and communication. Notable other programs include the BS in crisis and disaster management, which prepares emergency management professionals. Meanwhile, the MS in aviation technology is a nationally recognized program that prepares graduates for careers in aviation safety, aviation management, and safety program management. This degree offers three concentrations: emergency management, business continuity, and hazardous materials. One of the most affordable online colleges in Missouri, UCMOnline boasts one tuition rate regardless of which state you live in. Maryville University of St. Louis provides market-relevant academics and innovative technology provide an education to virtual learners everywhere. Maryville Online’s catalog of degrees include bachelor’s degrees in healthcare management, nursing, cybersecurity, and accounting. Master’s degrees can be earned in business administration (MBA), management and leadership, software development, and business data analytics. Approximately 3,000 nursing graduates completed their degrees at Maryville Online, and completed their clinicals in locations near their home. Online classes are delivered via Canvas, with an average of 15 students per course. The school is among the most affordable colleges in Missouri, with approximately $80 million in aid distributed last year. Situated in the foothills of the Ozark Mountains in Joplin, MO, Missouri Southern State University serves approximately 6,000 students across more than 140 degree programs. Some programs are offered asynchronously at MSSU Online. Bachelor’s degree programs are administered using the Blackboard LMS in criminal justice, business administration, and health sciences. Baccalaureate degree completion programs are also offered in environmental health and safety, health science, applied science, and general studies. The school is one of the most affordable online colleges in Missouri, and provides competitive tuition rates. MSSU has also expanded its in-state tuition boundaries to include Kansas, Arkansas, Oklahoma, and many parts of Illinois. With a distinctly Christian environment, Hannibal-LaGrange University offers associate, bachelor’s, and master’s degree programs in dozens of disciplines. The school’s small size facilitates personalized learning in classrooms with a 14:1 student-faculty ratio. Online learning includes a bachelor’s degree completion program in business management that can be earned in as few as 18 months. All of the school’s master’s degrees are fully online, with accelerated learning options leading to degree completion in as few as 50 weeks. Three areas of study are offered: leadership, education administration, and education. The school’s tuition is reasonably priced and 93% of students receive some form of financial aid, making it one of the most affordable colleges in Missouri. Established in 1849 and home to about 1,000 students, William Jewell College lets students personalize their education according to their career goals and interests. Classes at Jewell are small, with a 10:1 student-faculty ratio. Distance learning options include an RN to BSN -- a selective program for RNs with an associate degree in nursing from a regionally accredited institution. The school also offers many courses online throughout various degree programs. Jewell is one of the most affordable Missouri universities and offers competitive tuition, generous financial aid packages, a four-year tuition guarantee, and approximately 99 percent of students receive scholarships. Southwest Baptist University offers online learning to reach a wide variety of learners, from current students seeking supplemental coursework to working professionals. The school actively integrates faith with their academic programming, including online courses. SBU’s distance learning options also include online independent study and online degree programs. Baccalaureate degrees are offered in nursing and health sciences, while applied sciences and health sciences degrees are available in hybrid associate degree programs. Graduate-level degrees are offered in education and nursing. One of the most affordable Missouri universities, SBU offers affordable tuition and a full suite of financial aid options. Lindenwood University, rooted in the Presbyterian tradition, offers an integrative liberal arts curriculum throughout its professional and pre-professional degree programs. Online learning at Lindenwood features flexible coursework, comprehensive support services, and affordable tuition. The virtual college offers bachelor’s degrees in digital content strategy, nursing, criminal justice, and marketing. The bachelor’s degree in business administration, meanwhile, has several emphasis areas, including healthcare management and supply chain management. Graduate degree programs include MBA, MFA, and MPA. Courses are delivered asynchronously using the Canvas LMS and many degrees have accelerated learning options. One of the most affordable online colleges in Missouri, Lindenwood has a full complement of financial aid options. Fontbonne University provides transformative education that inspires students to be critical thinkers and ethical global citizens. Distance learners can join this dynamic community -- without being in St. Louis -- through the school’s distance learning options. Graduate programs are offered fully online in business administration (MBA), education, supply chain management, and instructional design and technology. Hybrid baccalaureate programs are offered in business administration, management and leadership, and applied behavioral sciences. The school is also transfer-friendly, with almost half of its undergraduates having started their education elsewhere. Fontbonne is among the most affordable colleges in Missouri with competitive tuition among similar institutions in the region. Lincoln University offers an online MBA program delivered to working professionals who require a flexible education. The program has two areas of emphasis: management and public administration policy. Overall, the program provides learners with a “big picture” perspective on the business environment, while also delving into the areas of specialization. Core curriculum courses include accounting, corporate finance, and business strategy. All online MBA applicants must complete prerequisite courses. LU Online also offers courses via Moodle to a wide variety of learners, including high school students engaged in dual enrollment, students supplementing on-campus learning, and lifelong learners. LU Online is among the most affordable Missouri universities. The state of Missouri's higher education system serves over 450,000 students through 13 public four-year universities, 26 independent colleges and universities and over 150 private career schools. Distance education is gaining traction in the "Show-Me" state, with 54,859 students attending wholly online programs; of this total, 4,499 students attend public, four-year programs and 15,674 are enrolled in private four-year institutions. Missouri's commitment to furthering distance learning is evidenced by the creation of the Missouri Virtual Instruction Program. This exciting initiative provides online learning to K-12 students, regardless of the type of school they attend. On the postsecondary level, the University of Missouri works to encourage collaboration with other higher learning institutions through its WCET e-Learning Consortia. Prospective students should explore the financial aid offered through the Missouri Department of Education, which provides a variety of information, services and programs. Between 2013-2014 alone, the MDHE granted $107 million in state-based student financial assistance to over 70,000 students. Distance learners should seize the opportunity for the ever-growing, affordable online education offerings in Missouri. 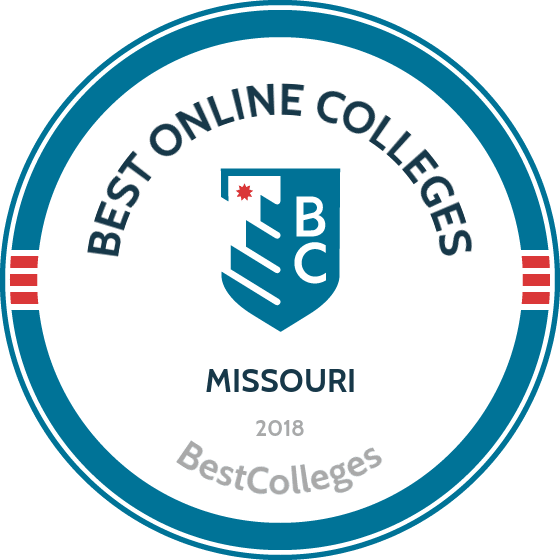 Browse our list of the best online colleges in Missouri for more insight into distance learning programs in this state. Of the nearly 450,000 students enrolled at Missouri institutions, just under 55,000 (12.2%) are exclusively enrolled in online learning courses. The number of students undertaking online classes alongside traditional campus educations totaled 67,085, or a further 15% of the statewide student population. There's a growing buzz for online learning in the state, and options for study are expected to expand in the coming years. Employment growth in this profession is moderate in Missouri. According to the Missouri Economic Research and Information Center, long term projections show an increase of 13% in the total number of jobs between 2014 and 2024. Wages increased by 17% from 2011-2016. In 2016, what were the top careers in Missouri for people who had a degree in business administration and management? Data source: Missouri Economic Research and Information Center, Bureau of Labor Statistics. Data may not be available for every year. Employment growth in this profession is strong in Missouri. According to the Missouri Economic Research and Information Center, long term projections show an increase of 15% in the total number of jobs between 2014 and 2024. Wages increased by 5% from 2011-2016. In 2016, what were the top careers in Missouri for people who had a degree in registered nursing? Employment growth in this profession is strong in Missouri. According to the Missouri Economic Research and Information Center, long term projections show an increase of 18% in the total number of jobs between 2014 and 2024. Wages increased by 27% from 2011-2016. In 2016, what were the top careers in Missouri for people who had a degree in health/health care administration/management? Employment growth in this profession is strong in Missouri. According to the Missouri Economic Research and Information Center, long term projections show an increase of 173% in the total number of jobs between 2014 and 2024. Wages increased by 20% from 2011-2016. In 2016, what were the top careers in Missouri for people who had a degree in criminal justice/law enforcement administration? Employment growth in this profession is strong in Missouri. According to the Missouri Economic Research and Information Center, long term projections show an increase of 22% in the total number of jobs between 2014 and 2024. Wages increased by 1% from 2011-2016. In 2016, what were the top careers in Missouri for people who had a degree in marketing/marketing management?